Put It Away was developed by a Stanford University student to help teach children how to maintain essential living spaces. 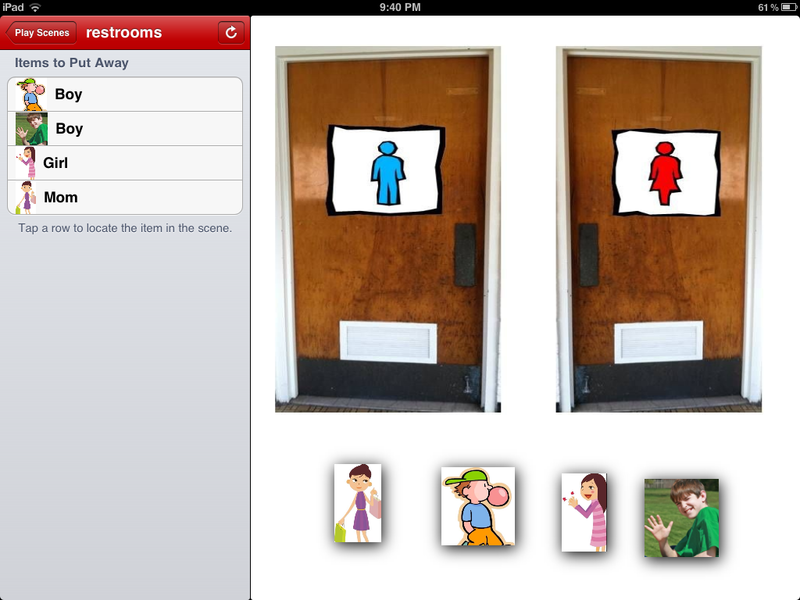 The app can be customized to enable parents and teachers to simulate actual rooms at home or school. And, if you are a creative SLP (and we all are), many uses can be found for this app. Here are some ideas. Please add your suggestions. Use the ready-made activities to talk about location words / spatial concepts. Take a picture of the kitchen area of an early childhood classroom, foods, and other kitchen items to talk about the function of each item and where each item belongs. Thank you to my good friend and paramount ECSE teacher for this idea. What’s wrong with this room? – During articulation and language therapy, ask your students to tell what is wrong with the messy room and tell how to fix it. Sort items that belong in a backpack verses items that stay at home. This app can be used for so many sorting activities; money, colors, shapes, and animal habitats are just a few. I made the following activity to help students, with special needs, look at signs on restroom doors and determine which restroom is appropriate for each gender. You can easily take pictures of the restroom doors in your building and use student’s pictures. 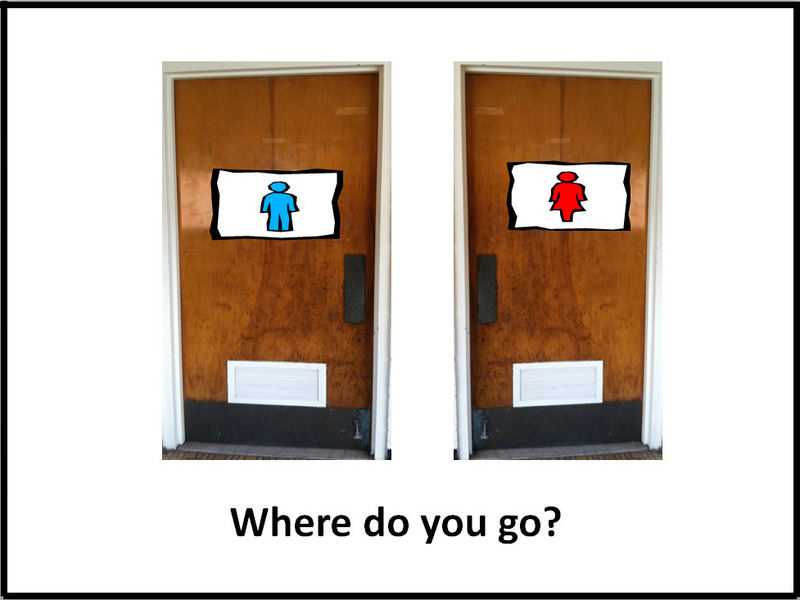 I took pictures of the restroom doors in my building, put them on a PowerPoint slide and added graphics to the doors. I saved the PowerPoint slide as a jpeg and sent it to my iPad. For those of you who don’t have an iPad or want an additional restroom sign activity, download the PowerPoint by clicking here. Hi! I'm the developer of this app and it makes me very happy to see this post! I'm glad it could be helpful and it's interesting to see how you've creatively adapted it for other activities! If you have any feedback or comments please don't hesitate to send me a note (leehsueh [at] stanford [dot] edu)! Thanks again!